Matching Numbers. Chassis # 1980404500024 Engine # 1989804500055 Body# 1989804500022 DB 180 Silver Grey Metallic with Correct Blue Vinyl/Blue Plaid Fabric Interior. Knock Off Wheels. Fitted Matching Luggage. Original Long Gooseneck Shifter. 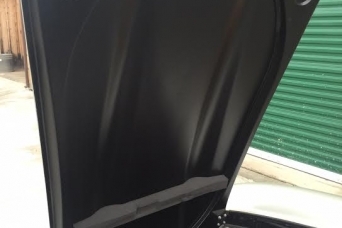 Factory Concave Grill/Barrel. Original Jack. Hammer. Tools. Belly Pans. Spare Knock Off Wheel. Accompanied by factory data card and build sheet. 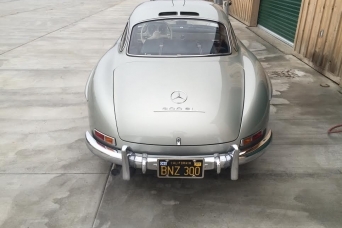 Originally delivered to Mercedes-Benz Distributors of Los Angeles, Ca, this car was bought new by lifetime enthusiast and founding member of the Gullwing Group George W. Nixon of Oakland, California. Nixon owned the car until 2011, when his estate sold the car to the current owner. It is a 2 owner car from new. While George Nixon has passed, his prized 300SL Gullwing moves on. #24 is special beyond the typical Gullwing. In 2011, we, Scott Grundfor Company, tried to buy this 300SL when still in its Red with Grey interior form that George had put the car to in the 90’s. It was a lovely well taken care of example, and was clearly owned and used by someone worthy of the title “A Gullwing Group Founder”. We would not have changed a thing at the time, it was a beautiful lifetime California example. Now the car is beyond exceptional and with the return to original colors, we can only imagine George would smile with nostalgic fondness were he here today to see the car restored to a state nearly identical to when he first laid eyes on her. Not only is the soul and original “rumble” of George’s car still alive and well in today’s incarnation of #24, but the cosmetic job completed in 2015 by our good friend Rudi & Company truly brings out a quintessential early 300SL Gullwing example at its very best. Aside from ownership history, the car itself distinguishes through it’s original long gooseneck shifter, concave/curved barrel and overall originality as new…it is simply one of the best Gullwings one could ever wish to own and is as well taken care of from birth at the factory to today as any 300SL you will ever find. 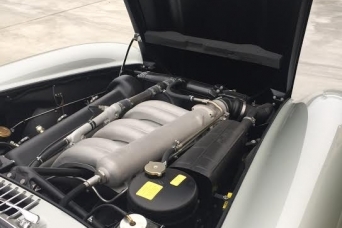 A body-on restored lifetime California car with zero rust, no accidents and a truly unique opportunity to own a piece of 300SL history. Cars with such long term original ownership history are extremely rare, even rarer still are long term ownership histories comprised of true enthusiast stewardship all the way through, which is most certainly the case with #24. 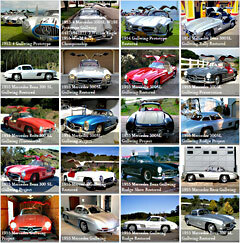 Paul Newman’s 1954 Mercedes-Benz Gullwing SOLD: 1954 Mercedes-Benz 300SL Gullwing SOLD: 1955 Mercedes-Benz 300SL Gullwing A working 1954 Mercedes-Benz 300SL Gullwing …made of LEGO!